Handwritten ledger. 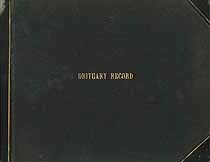 Title page says, Obituary Records, The I. O. O. F. Lodge Record, Watertown, N. Y. Page one has , New Lodge No. 451, I. O. O. F. written on it. Page four has Corfu Lodge No. 634, I. O. O. F. written on it. The New Lodge members are buried in Darien Center, N. Y., The Corfu Lodge members are buried in Corfu, N. Y. Names in this online transcription include Acquard, Ames, Amlinger, Bailey, Bangert, Bartlett, Beach, Bell, Bennett, Bigelow, Blundell, Bommer, Bordwell, Boyce, Boyer, Brown, Buckel, Burns, Burr, Carlo, Carrier, Cathie, Christopherson, Collins, Conibear, Crawford, Curtiss, De Temple, Dickinson, Duench, Durkee, Ehmann, Etzold, Fisher, Frisby, Fritsch, Frost, Fuller, Gerhardt, Goleghtly, Grannis, Green, Griswold, Hall, Happ, Harper, Haskell, Havens, Healy, Herman, Hershey, Hilborn, Huff, Hume, Huntley, Ireland, Julius, Kennedy, Kenyon, Kiebler, Kiehl, Kinne, Lathrop, Lawrence, Lombard, Long, Mayne, McCaw, McClurg, Meinweiser, Miller, Neeland, Norton, Palmer, Perkins, Phelps, Pomeroy, Porter, Post, Preisach, Price, Raines, Rapp, Remsen, Reynolds, Rholf, Roberts, Robertson, Robins, Robinson, Rogers, Rutty, Sagers, Schelt, Schurr, Schworm, Silliman, Simonds, Sisson, Smith, Southeland, Stanley, Sumner, Tupper, Turner, Vickery, Voorhees, Ward, Welcker, Welker, Witeing, Wittman, Wood. The Genealogy Today catalog number for this item is 16101. When inquiring about the information in this resource, please mention the catalog number.